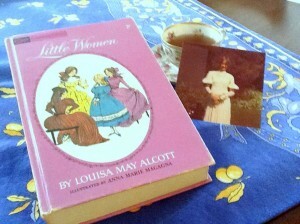 During her 55 years, Louisa May Alcott wrote more than 30 books. The first one, Flower Fables, was written when she was just 22 years old. Little Women, one of my girlhood favorites, of course followed, as did Little Men, and Jo’s Boys. As I approach another birthday and the age of 55 no longer seems so far away, I sometimes lament my lack of prolificacy. I started writing the novels when my son was in pre-school. That boy is now a junior in high school, and only one of my novels (Nonna’s Book of Mysteries) has seen the shelves at Barnes and Noble. I’ve been fiddling around with my second book, Alchemy’s Daughter, on and off for more than a decade. (There really is another book, I swear.) Sure, I’m a single mother and work part-time as a nurse, but Louisa May Alcott had other responsibilities, too. Alcott’s family, although well educated and friendly with the likes of as Emerson, Hawthorne, and Thoreau, was poor. So at a young age, Alcott had to help support her family. At various times she worked as a teacher, seamstress, governess, and domestic helper. Although she never married, she raised her niece following her sister’s death. Louisa May Alcott stayed on course with her writing, no doubt, because her stories quickly became successful and writing became a lucrative livelihood. These days, when writers as well as publishing outlets abound, it is perhaps harder than ever to make a living as a writer. Most of us hold day jobs in order to survive. Almost daily, I say to myself, “I wish I had more time to write.” I am constantly sidetracked by family commitments, cooking, cleaning, running errands, email, not to mention the paying job. There is always something that needs to be done. Nevertheless, I do find some time to write. A little bit of writing time each week, added up over the years, has cumulated in two novels. While two books are well shy of Louisa May Alcott’s body of work, two books are better than no book. This entry was posted in Writer life and tagged fiction writers, finding time to write, Louisa May Alcott, Nonna's Book of Mysteries, the Alchemy Series, writers resources, writing fiction. Bookmark the permalink.